The past few baskets from Bountiful Baskets have had beets in them, which I love! 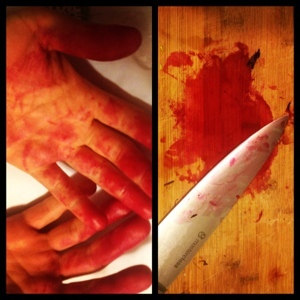 Every time I experiment with beets, my kitchen looks like a total crime scene. See Exhibit A. 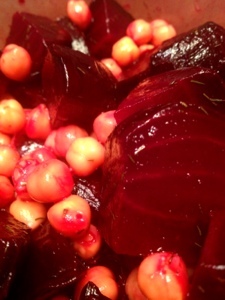 This simple salad is compromised of roasted beets, chickpeas, lemon juice, maple syrup, and dill. Might I suggest you don't knock it until you try it. At first blush it may seem like these ingredients were never meant to be together, but by the time the credits are rolling on your feeding opportunity, it becomes apparent that they were star-crossed lovers the whole time. All they needed was some chaotic/traumatic event to force them together. That really escalated quickly. I literally have no idea how I got off on that Kelly Kapoor tangent. Anywho, this salad is good warm, cold, or at room temp, but really it's only good at room temp. peel and roughly chop the beets. combine all ingredients in a bowl and pop in the fridge for 30 minutes - overnight. That looks amazing, and a little scary!